« Back to School Busyness… and another first! Several years ago, my oldest started kindergarten at one school, my middle child attended preschool at another, and my youngest was in a parent’s day out program at yet another school. Keeping track of where everyone was supposed to be and when I had to pick them up was mind-boggling (for me, anyway — I’m easily boggled). I tried to come up with a system for managing the daily schedule and decided an Excel spreadsheet works best for me. It was a pain to create and took a lot of time, but it is really helpful to be able to see at a glance where each kid is supposed to be on a daily basis. A print out of the spreadsheet hangs on a wall next our big family calendar, where I write all the other events (dr’s appointments, field trips, playdates, etc.). Here’s an example of last year’s schedule*. If you look at the schedule, you’ll see each kid has a color coded column. I bought colored Sharpie pens in corresponding colors so that when one of the kids has a specific, non-recurring event (like a dr’s appt), I write it on the family calendar in their color ink. Color coding the family calendar also works for me. In addition to start and end times for things like school and after school activities, I also list things like the daily academic “specials”, so we’d remember to bring library books on library day and wear sneakers on PE day. As we scramble to put on backpacks and get out the door each morning, I glance at the calendar to make sure everyone has everything they need. A color-coded weekly schedule works for me. What are your organizational tips for managing the school week chaos? You can find more tips at Works For Me Wednesday, a blog link-up hosted by We Are That Family. *Note: the idea of posting our personal schedule online was unsavory to me, so I made significant modifications to it to ensure it does not resemble our actual schedule then or now. 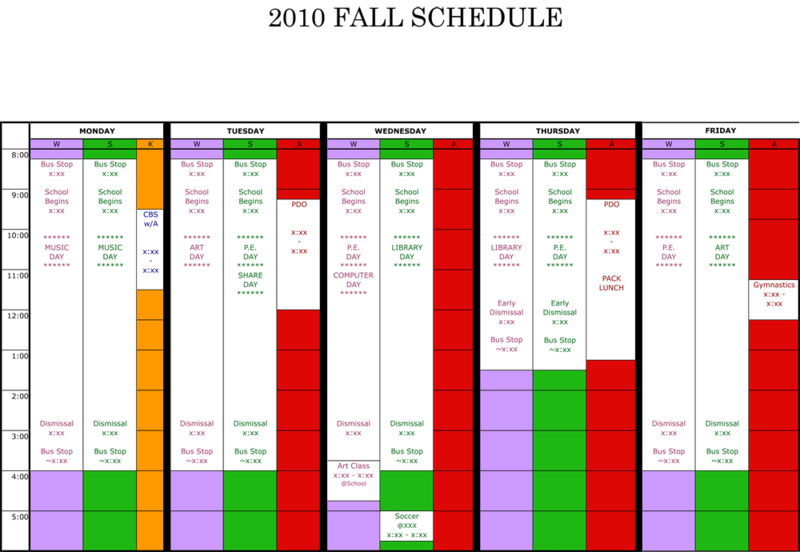 Do you mind sharing the template that you use for color coding the kids schedule? What a great idea! This seems like a great schedule. However, I am horrible with Excel. Can you provide the template/spreadsheet that you used so that I can fill in what applies for my family?